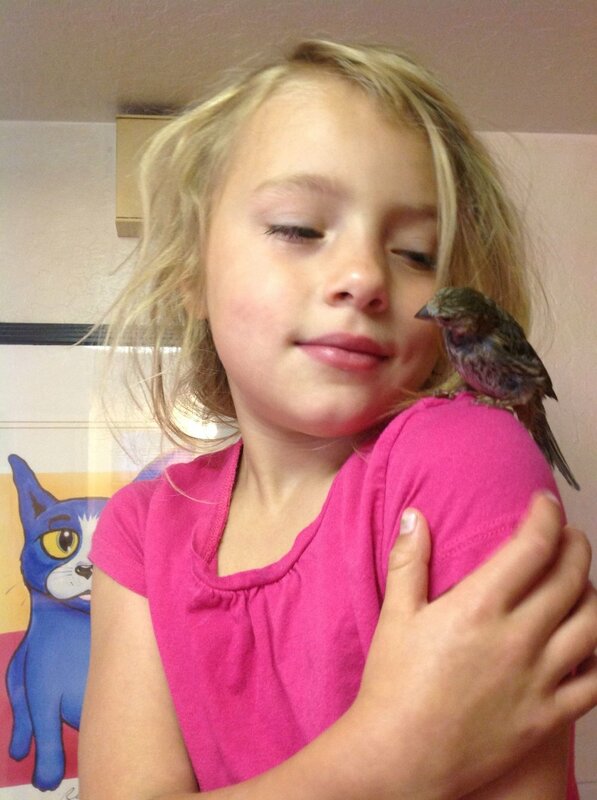 This photo is of my daughter, Autumn, at age 7 (she’s 10 now) and that scraggly bird on her shoulder is Beaky the Sparrow. My daughter is looking teary because Beaky always sat on my shoulder- it had imprinted on us as a hatchling- but never hers. Turns out it was about altitude. I put Autumn up on a table and Beaky happily sat on her shoulder, and in this picture Autumn is tearfully, lovingly grateful. Beaky is long gone now, lit out for birdy freedom, but raising her from a hatchlin was an amazing, life-affirming experience. She spend most of her youth looking all ragged from molting but filled out and became beautiful before she left us. We absolutely enjoyed the time we had with her. She was an arrogant, super self-confident little character, puffed up and full of herself, outraged at our insolence and constantly diving back into the fray, then following us around the house in a “Where are you guys going? Let’s play!” kind of way. She was always playing in that cocky birdy way of hers, it was great. And now I draw birds all the time, mostly sparrows, or the humbler birds. I like their character, unconscious beauty and self-possessed focus on the task at hand, and their hilarious dignity. Eagles, owls, hawks would be grander but what can I say? Beaky the Sparrow had more character and love then any of those football team mascots, those national icons, those predators, those killers. I’ll take a sparrow any day. Vectors of the Sparrow hatchlings in ‘Beauty can save the world’ coming soon. Traced on the iPad with an iPencil. The print will be three colors, white, black and dark grey on lighter grey paper.